I was intrigued by the "New Moulds" statement on the box top and had high hopes that perhaps Italeri had risen to the challenge laid down by Trumpeter with Trumpy's completely new HEMTT offering included in their monster Patriot Missile System. As apparently everyone BUT me already knew, Italeri's entire current line of "new" HEMTTs is just a rehash of their old poorly detailed molds with a few truely new sprues thrown in. I will say that at least the new sprues seem to be done to modern 21st century standards. The base vehicle however will take a lot of work. The other new parts are nicely molded rubber tires and new wheels. They are actually pretty good and fix probably the biggest issue of the older kits, the horrible tires. I too have this kit and will be adding the flatrack and erector parts from it to a Trumpeter M983, along with some other parts, to make an M1074 PLS. The boxart is excellent having been drawn directly from a real life, combat zone photograph as reference. Also a slight peeve of mine personally - they show the exhaust stack counter weighted flap cap in the open position whereas on the model the flap cap is closed and of an impossible, incorrect design. is there anyone who buy italeri kit encounter problem ? when applying enamel wash,the italeri plastic plastic become solf and snap. I have never had a problem like that and I don't think it is an issue with the kit. It sounds like your wash is too "hot", meaning there is too much thinner which is reacting w/the plastic and breaking it down. The other new parts are nicely molded rubber tires and new wheels. They are actually pretty good and fix probably the biggest issue of the older kits, the horrible tires. 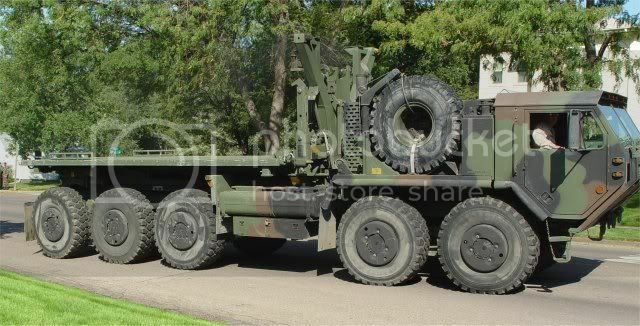 IU too have this kit and will be adding the flatrack and erector parts from it to a Trumpeter M983, along with some other parts, to make an M1074 PLS. I considered the exact same solution but decided against it. I have already ordered the engine replacement kit from "Real Models" and am considering ordering the resin tires as well. Gino, if I end up going with the resin tire set you are more than welcome to this kit's rubber tires and wheel hubs! I appreciate the new work Italeri did on the revised tires. It is definitely a step in the right direction, they even included some raised lettering on them! But they chickened out on actually putting the Michelin X brand name on the tire and I like to see the REAL (not made up) lettering on the tire. I would have even been happy if they had intentionally misspelled the name but no. Thanks, but I am good on the tires. Can't wait to see how yours turns out. I plan on starting mine soon...hopefully. 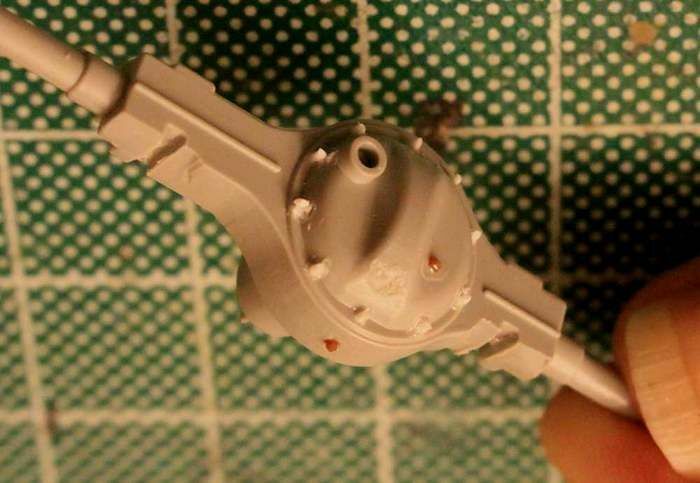 Richard, I have not had any such paint problems with the Italeri kits or any others but then my normal treatment is a coat of primer, then the finish color. After that I do some very light pin washes followed by pastel chalk so clearly I am not doing anything that would "stress" the plastic that much. As Gino was saying is sounds like you are just using too "hot" a mixture. When I used to build railroad rolling stock out of actual wood I would use a technique similar to what you describe. I would flood the painted car side with thinner and let it just stand on the surface to "raise" the fresh paint and give a very aged, weathered look. Anyone who has seen some of my previous work (Russian MAZ 8x8's) knows that I am a stickler for having fairly correct and complete underbody and driveline detail. 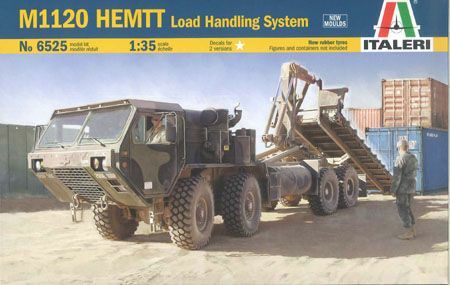 After seeing the job the Italeri designers did on the HEMTT driveline it leaves me wondering if any of the design engineers ever actually laid eyes on a HEMTT driveline? 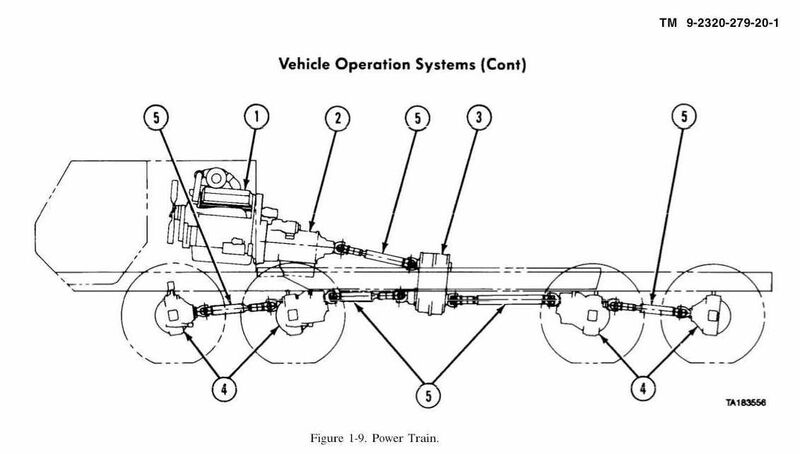 At least in the case of the Italeri M1120 model the driveline would functionally work (unlike some other kits I have dealt with!) It just would not work for very long and the Italeri kit clearly fails to match the reality of the vehicle in a number of major ways. Please note in the TM drawing above; the engine and transmission are inclined and not sitting flat square as Italeri's undetailed, ugly block of cheese engine would have the model builder think. Additionally the transfer case and all four differentials are also slightly inclined. Universal joints work best, last longer and can carry more stress when the angle of axis bend (don't know what else to call it) is kept as small as possible. Clearly Oshkosh has tried to minimize the angle of bend on all the driveline universals to maximize the vehicle strength, endurance and dependability. To my mind this is a fact that the Italeri design engineers decided to intentionally overlook, I guess because zero degree and 90 degree angles are just that much easier to lay out on their CAD design drawings. This is simply laziness on the part of the model manufacturer at the expense of greater accuracy in the model. It would not have cost the company that much more in initial design hours to do it correctly in the first place and would have cost literally nothing in additional manufacturing expense! I'm sorry but if I owned the company there would be a design manager somewhere that would be out of his fancy office and back out on the floor doing basic CAD scut work tomorrow! 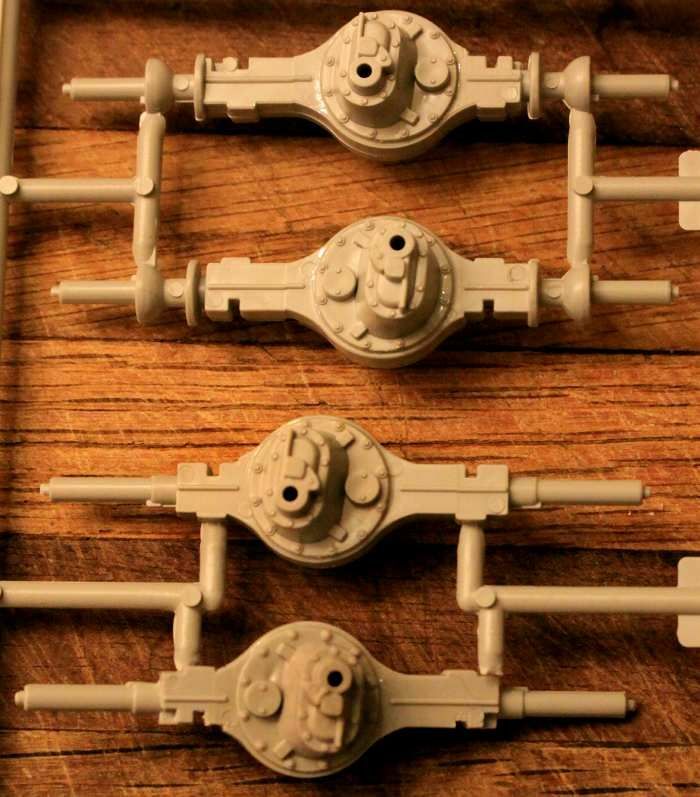 I will say that at least the new sprues seem to be done to modern 21st century standards. The base vehicle however will take some work. Unfortunatly the new moulds are not the standard the we could expect today. If you check my photos on Primeportal, you will find a lot of opportunites to scratchbuild and superdetail the LHS and flatrack. i spoke with an Italeri Manager in Nuremberg to offer some assistance and he told me that they got help from some guy from the US. I decided to go the hard and expensive way and Mount the LHS to an extended Trumpeter chassis. I am not sure if I will ever lay my hand on an Italeri kit. Hans, would you please include a link to your album on Prime Portal as I am not finding it? I would be very interested in additional reference. Angling the transfer case was no problem. A little lite sanding to the mounting pegs - there was almost enough play in the mounting indents to achieve this degree of incline with no other modification other than twisting the T case as the glue dried. Added some more bolt heads to the T case plus built the air operated shift solenoid on the back side. The T-case profile is not an exact match for the real HEMTT but I can live with it! Another bone to pick with this model: All four of the differentials are more or less the same on the model which is NOT correct. Axles #2 and #3 should have the gear heads and they do. 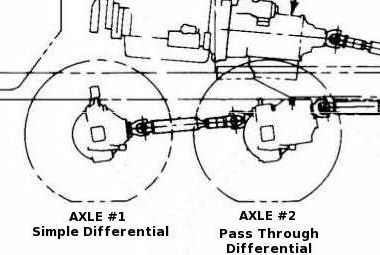 But axles #1 and #4 should be just simple differentials (If there is such a thing as a SIMPLE differential!) Meaning no added gear head, however Italeri makes all four diffs with the same gear head. WRONG! Simple differential without pass-through or gearhead. It is unfortunate that Italeri chose to go this way in that they cast the differential heads as separate pieces so they easily could have given us two with gear heads and two without. The Italeri AND the Trumpter differentials all the same! p.s. 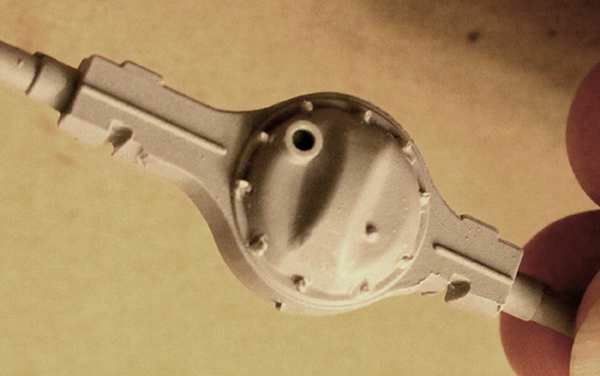 Hey, how come one side of the diff has bolt head detail and the other side doesn't, even though this is a straight pull, two part mold and you could easily put bolt head detail on both sides??? Also no oil check drain plug in the diff either! 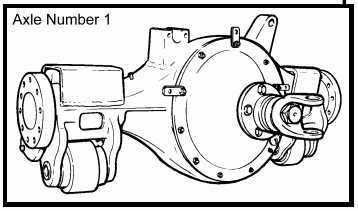 The transfer case is the same way. It is a straight pull two part piece but bolt detail on one side and not on the other. Working now on the differential for axle #3 which is the easiest to convert and angle upwards towards the transfer case. I Mike, I will be following your build. I know that this model will be up to your usual standards. Because the original molds are over 20 years old and Italeri is not normally known for fine details. 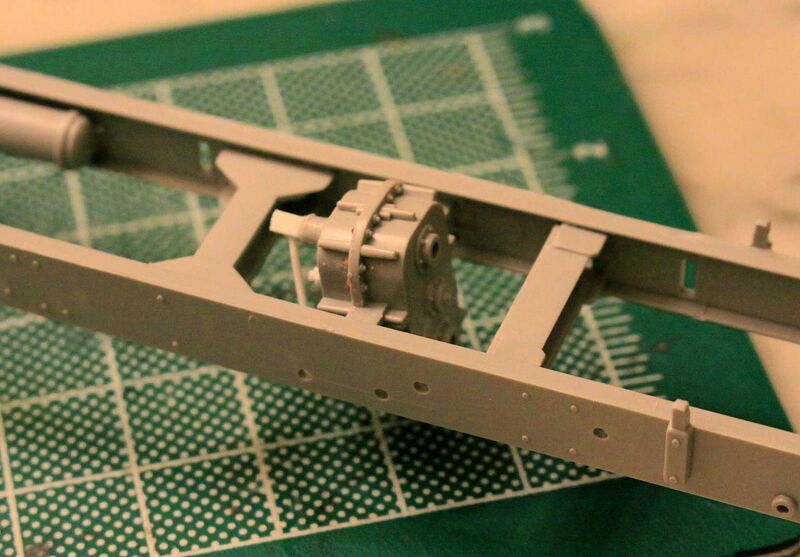 This is why I will be using the Trumpeter M983 kit as the basic truck model and adding the new LHS parts to it. The Trumpeter HEMTT parts are much better. Bolt Head Detail, Oil Drain Plug and Oil Fill/Check Plug added to axle #3. I would be incredibly naive if I said I did not know this already about the Italeri "New Molds" kit before I purchased it. However this truly is my first HEMTT and I am just commenting on what I see. One axle down - but unfortunately the easiest one. Axle #3. Now I need to figure out how to alter the simple differentials and how to cant (steer) the front wheels. Oh man, its to bad the Italeri reboxed their old kit with a new parts to make this vehicle. I was hoping they will do a whole new tool of their Hemtt. I guess we can hope Trumpeter will do something in the line as this M1120. Trumpeter got my M1120 pics. Looking good, Mike! Will be following along for sure.